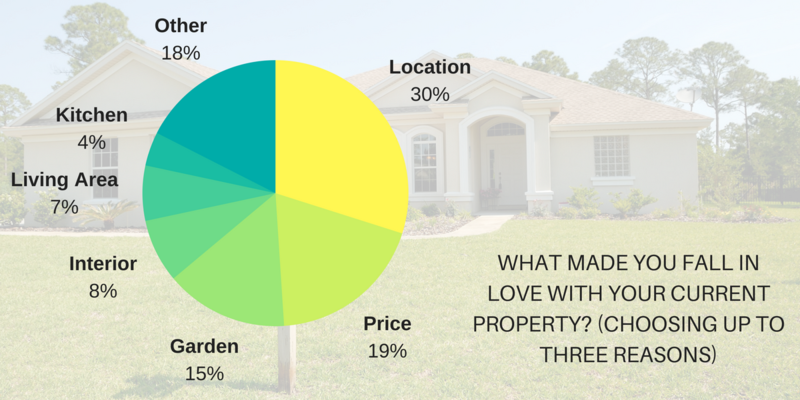 What Do Homebuyers Look for in a Property? This infographic was constructed with information from this source. Evidence indicates that a successful marketing strategy is focused on people rather than any other element. This in part is due to personalisation. Every person is different, and looking for a property that will match their needs and persona. Whether you are buying or selling, it is crucial to pinpoint your property’s standout features, and make them the headline if you are a seller. Many homebuyers will notice distinctive details such as an original fireplace. Flooring Republic interviewed a thousand UK residents to provide insight into what homebuyers in modern day Britain look for. The research delved into reasons homebuyers love their home as well as the must-have factors they looked for in their property investment. Over a third of respondents in the survey deemed room size to be the most important factor. You can expect viewers to look up at the height of the ceiling. 15.5% claimed that the appearance of the exterior was important to them, and another 15.3% said the same about the interior. This may prove more difficult, with current housing shrinking to just half the size it was in the 1920s. An overwhelming 60% valued the neighbourhood as the most important when investing in property. In addition, most 45-54 year olds would look at the wider local community before dipping into their property funds. Of course, what people want in terms of location can vary significantly. Important features include accessibility to airports and rail services. For parents, being in the catchment area for a good school is vital, which is why properties near top schools are more expensive. Other nearby essentials include restaurants and entertainment venues that are within walking distance. In terms of neighbours, a vendor is legally obligated to tell a buyer if the homeowner has ever complained to a local authority. Half of the survey’s respondents chose the property’s price as an important factor, as expected. Yet again, it is not surprising that nearly two thirds of these votes originated from 18-34 year olds. According to Doug Crawford of My Home Move, Britons love bargains. With house prices at a seemingly constant rate of increase, first-time buyers taking their first step on the property ladder would rather spend time looking into up and coming locations to truly get value for money. A successful property sale partly relies on luck, as you might be offering exactly what the buyer is looking for. One man’s cracks in the walls could be another’s renovation project. One location could be too far away for one person and central for another. It is interesting to note that whilst space and aesthetic appeal are still important to various age groups, price is being held to a much higher standard, especially to those at the start of their investment journey.